Brown Fused Alumina(Brown Fused Aluminum Oxide, Brown Artificial Corundum)as media for sandblasting abrasives, polishing. This is great blasting media for surface prearation and polishing, or grinding media. Sharp edged materials, high intensity. There are several variants of the process, such as bead blasting, sandblasting, sodablasting, and shot blasting. Abrasives blasting is the operation of propelling a stream of abrasives materials as media against surface under high pressure by using blasting cabinets or blasting guns to polish, shape or toughten a suface, or to remove contaminants off this surface. 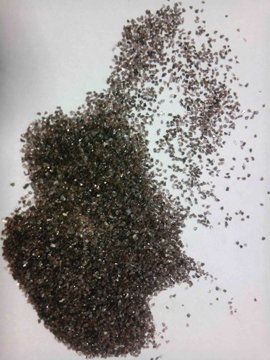 This is an important process of surface preparation for metals or other materials.Common abrasives materials used are copper slag, nickel slag, garnet, aluminum oxide brown and white, silicon carbide, steel shot, glass beads, plasic beads, silica sands etc. Brown Fused Alumina is an important materials for sandblasting. Sizes available in FEPA F8,F10,F12,F14,F16,F22,F24,F30,F36,F40,F46,F54,F60,F70,F80,F90,F100,F120,F150,F180,F220,F240 etc. Our Brown Fused Alumina for sandblasting contains about 95% Aluminum Oxide and certain content of TiO2 which makes this material tough and blocky for blasting. The process of smelting also makes the material with high bulk density & toughness.